Are you looking for the best product review plugins for WordPress? If you regularly add detailed product reviews on your website, then you can use a product review plugin to make them more SEO friendly. In this article, we have hand-picked the best product review plugins for WordPress. Why Use Product Review Plugin in WordPress? What do you do when you want to buy something? If you are like most people, then you probably check out product reviews to compare different options. That’s why there are so many popular reviews websites like Yelp, TripAdvisor, Rotten Tomatoes, and more. Even Amazon, world’s largest online store features product reviews so prominently. Many WordPress site owners write product reviews to make money online. Some get paid directly by the company for the review while others use affiliate marketing to earn revenue. You can write a product review as a blog post. However, a plain blog post does not use product review format supported by search engines. This means your article will not be highlighted in search results as a review. For better SEO, you need to write your reviews with schema.org rich snippets format. A product review plugin helps you easily write search engine friendly reviews that also look great on your website. Let’s take a look at some of the best product review plugins for WordPress. WP Product Review is the best WordPress product review plugin. It comes with a detailed settings section allowing you to choose how you want to manage and display reviews on your website. Adding a product review is quite easy. Simply select the product review option when writing a blog post and the plugin will show you all settings to write your review. You can break down your review into features, add images, pros and cons, and more. It comes with sidebar widgets allowing you to showcase your reviews. You can also use it to collect user submitted reviews or allow your users to add their own rating and reviews in the comments. All reviews are displayed in schema.org rich snippet format for maximum SEO benefit. For detailed instructions, see our guide on how to create a niche review website in WordPress. As we mentioned earlier, your reviews need to be in a proper SEO friendly format. All in one Schema Rich Snippets plugin allows you to write different types of posts using the rich snippets format including product reviews. Simply select ‘Item Review’ from a drop-down menu when writing a blog post, and the plugin will show review options like reviewer name, product name, and star rating. It will display this information below your blog post with the correct SEO friendly markup. The plugin can also be used to add articles, products, recipes, software and more. For detailed instructions see our article on how to add rich snippets in WordPress. 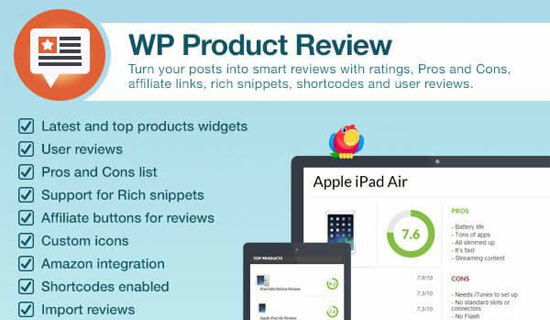 WP Review is another excellent option to add product reviews in WordPress. It is beginner friendly and quite easy to use. Upon activation, simply write a new post and select the review type. It supports three types of review ratings stars, points, and percentage. You can also add different ratings for individual features if you want. It also supports user ratings which simply allows users to submit their own ratings for a product. It also comes with styling options located under Settings » WP Review page. From here you can choose your own colors for the review box to match your theme colors. Rich Reviews is a simple free plugin that allows you to add reviews of your own products, services, or website. You can also allow your users to submit reviews. It uses shortcodes to display reviews, and you can display a review anywhere on your website including posts, pages, and sidebar widgets. If you are collecting user-submitted reviews, then this plugin allows you to manually approve each review before publishing it. The plugin’s settings panel comes with detailed instructions on how to use it. WP Customer Reviews plugin allows you to collect customers reviews as well as create your own product reviews. Upon activation, simply edit a blog post where you want to add a product review and check the reviews option. Next, you need to go to the Reviews » All Reviews page and click on the add new button. After that, you can select the post and write your review. The plugin also allows you to enable user submitted reviews which you can then approve and publish to display on your website. This plugin also allows you to customize the review form shown to users and comes with a how to use page with detailed instructions. Site Reviews allows you to collect customer reviews for your products, services, or local business. It comes with a simple settings page allowing you to control how you want to gather reviews, and how you want to display them. You can customize the review form and display it anywhere on your website using a shortcode. You can also display reviews using the shortcode. The plugin adds an easy to use shortcode inserter on the post edit screen to manually display reviews, review form, and review summary. We hope this article helped you find the best product review plugins for WordPress. You may also want to see our list of the best testimonial plugins for WordPress. The post 6 Best Product Review Plugins for WordPress appeared first on WPBeginner.